Ultimate Vegan Chocolate Beetroot Cake! After countless attempts at trying to make the ultimate vegan cake, I remembered reading recipes that use avocado, black beans, or beetroot, as the binder, and since I had a bag full of fresh beetroot in my fridge, I decided to give it a go and create the ultimate vegan chocolate beetroot cake. I peeled, diced, and boiled the beetroots in water, then pureed them in my food processor. I mixed my flax seed egg with hot water and added a hint of coffee, because why waste a free flavor enhancer opportunity? Well, not only did this vegan chocolate beetroot cake turn out exactly how I wanted it to, I also managed to make it oil free and gluten free! I melted a bit of 70% dark chocolate (you can also use 60%), then I thought why not go all the way and replace my coconut sugar with refined sugar free maple syrup? Which totally worked! So, after 2 attempts, I’m proud to share with you this fudgy, moist, chocolate beetroot cake. And if you’re at all concerned that you’ll be able to taste the beetroot, then let me assure you, all you’ll taste is pure chocolate. Mix together the ground flax seed, instant coffee and hot water, then set aside. For the beetroot puree, peel, wash and dice 1 – 2 beetroots, place in a pot covered with water, and cook until they’re soft. Reserve the water, then transfer the beetroot into a food processor and add just enough reserved water, to help it blend into a smooth paste. Reserve a tablespoon of beetroot juice for the ganache and store the rest in the fridge, for future colored frostings. Next, preheat the oven to 356 degrees F (180 C), then add the almond butter, beetroot puree, maple syrup and vanilla essence into the flax seed bowl and mix well. Gently melt the chopped chocolate either in the microwave, or over a ban marie. A ban marie is simply a pot filled with an inch of water and a heat proof, glass bowl placed on top. When it melts, add it to the flax seed mixture and give it a good stir. Mix together the baking powder, cocoa powder and almond flour, then add it to the batter and mix. Finally, transfer the mixture into the loaf pan, lined with baking paper, then smooth it out and pop it into the oven for around 20 – 25 minutes, depending on your oven. A toothpick test won’t work here, because it’ll always come out looking wet. So, just check to see that your cake has set in the middle, and the sides are starting to crack, I checked it after 20 minutes. When ready, take the tray out to completely cool, while we prepare the chocolate ganache. Store in an airtight container in the fridge, for up to 5 days. Want another chocolate treat to indulge in? 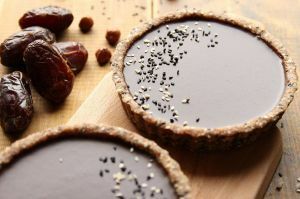 Then try my easy No Bake Tahini Infused Chocolate Black Sesame Tarts! They’re oil free, gluten free, and packed with chocolate goodness! ← How To Make Vegan Polenta In A Jar! Oh yum, this looks amazing. I love beetroot and chocolate together, it gives a special kind of richness, I think, and you’d never guess it was there! Oh dang I need a few slices of these to keep me going today! A long day of travelling is about to commence. Saving this recipe! Chocolate and beets? What more could I want! Two of my favorites things! Hi! As I write this I’ve got the beetroot cake in the oven. I’ve had it in there for way longer than 20 minutes. The middle is clearly setting but should it still jiggle a bit or should I bake it until there’s none? This looks truly delicious! I want to make these as muffins or cup cakes – please can you advise as to baking time and oven temp? Great, thanks will give these a try and let you know. When you say coconut milk do you use canned coconut full fat or the boxed coconut milk in the dairy section? Hi Barbara, any full-fat coconut milk is fine, whether it’s from a can or a carton box. I made this and it was delicious! Fooled my family it was made with beets. Do you think it would work with canned beets? I don’t see a problem why it wouldn’t work if it’s canned pureed beets. Hi how can I replace almond flour and paste with of choose to go nut free.